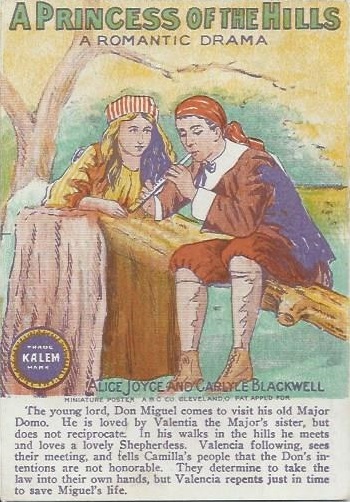 The young lord, Don Miguel comes to visit his old Major Domo. He is loved by Valentia the Major's sister, but does not reciprocate. In his walks in the hills he meets and loves a lovely Shepherdess. Valencia following, sees their meeting and tells Camilla's people that the Don's intentions are not honorable. They determine to take the law into their own hands, but Valencia repents just in time to save Miguel's life. with Alice Joyce and Carlyle Blackwell. Directed by George Melford. Kalem.